Police in the Himalayan kingdom of Bhutan say that they have killed at least five suspected Maoists in various operations over the last week. The rebels were killed as police were ensuring security ahead of elections on 24 March, police say. 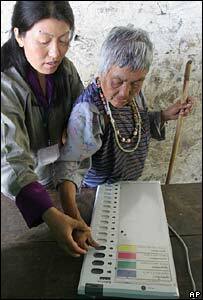 The elections to the lower house of parliament will complete Bhutan's move to a constitutional monarchy. The government says it is alarmed over several explosions in southern districts of Bhutan earlier this year. 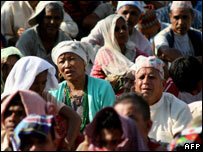 These have been blamed on underground Maoists and ethnic Nepalese rebels. Seventeen suspected Maoists have been arrested in the recent security sweeps, officials said. "We apprehend these groups will try to create trouble because they have opposed the elections," said Kunzang Wangdi, Bhutan's chief election commissioner, over the telephone from the capital Thimphu. Mr Wangdi said the Maoists and two other ethnic Nepalese parties have circulated pamphlets asking people to boycott the elections. "So we cannot take the threat of disruption lightly," he said. At least five explosions have rocked Bhutan in recent weeks - including one in the capital Thimphu. Eleven people sustained injuries but no-one died. Indian explosives experts say the bombs are crude but they indicate that the bomb-makers have access to Indian black markets where the material for making the bombs is available. About 100,000 ethnic Nepalese refugees from Bhutan live in camps in Nepal after they were allegedly made to leave Bhutan under government pressure in the early 1990s. From this population, three groups have emerged - the Bhutan Communist Party (Marxist-Leninist-Maoist), the Bhutan Tiger Force and the United Revolutionary Front of Bhutan. The Bhutanese Maoists enjoy support of their Indian and Nepalese comrades, intelligence officials say. "They are frequently crossing into India and going back with weapons and explosives. We have arrested some of them in West Bengal but they are still active," said West Bengal police intelligence chief Sujit Sarkar. The Indian security forces, particularly the Special Services Bureau (SSB) that guards the border with Bhutan, have been put on "maximum alert" along the 400km (250 mile) border to prevent insurgents from disrupting the elections. The Indian and the Bhutanese forces are also coordinating the border patrolling. A senior Bhutanese police official said they had raided two small Maoist camps in the jungles in the south of the country and captured at least eight rebels with weapons. This includes one Maoist "commander" . Leaders of ethnic Nepalese political organisations complain that there is "a climate of fear" prevailing among their people in southern Bhutan. "Our people are facing harassment by Bhutanese security forces. They cannot move and talk freely," said SB Subba, head of the Human Rights Organisation of Bhutan (HUROB), a group dominated by the ethnic Nepalese, called Lhotsampas in Bhutan. Will Bhutan be 'happy' as a democracy?